After two days at home, with me, Liam grudgingly went back to school today. He was very tired, but we all were. Nobody slept well last night, except Meg. Liam couldn't sleep because of his coughing. cindy and I couldn't sleep because of the coughing. Liam skipped P.E. 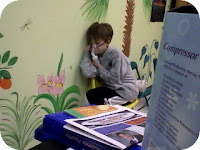 and had a breathing treatment (and brief nap) in Nurse Cindy's office. She snapped a quick photo to remember the event. Hopefully we all do better tonight. And tomorrow. We can all use a return to normalacy.